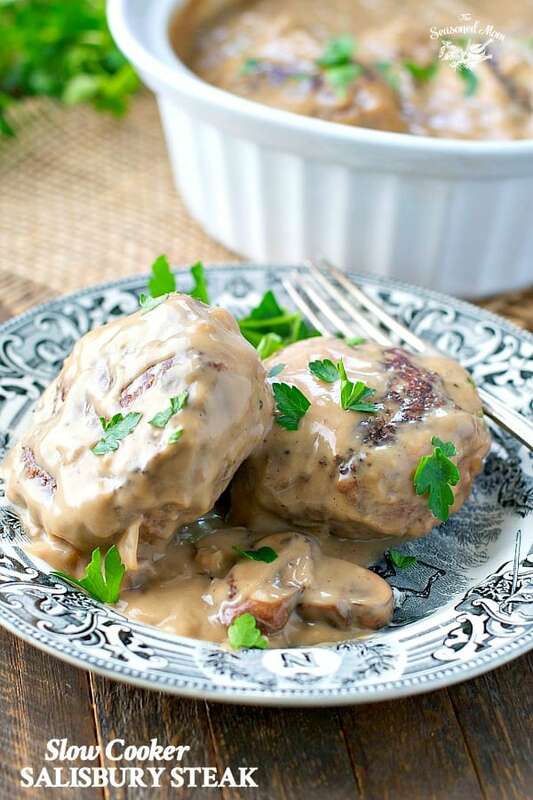 With only 15 minutes of prep, this Slow Cooker Salisbury Steak with mushroom gravy is an easy dinner any night of the week! 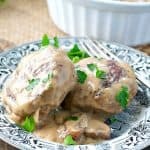 With only 15 minutes of prep, this Slow Cooker Salisbury Steak with mushroom gravy is an easy dinner any night of the week! The simple Crock Pot meal is made with French onion soup mix, cream of mushroom soup, and fresh vegetables for a well-loved retro classic! Like a giant hug at the end of the day, this easy Salisbury Steak tastes decadent, cozy, and warm. For big appetites, serve it with mashed potatoes or egg noodles to soak up the extra gravy (there’s plenty, believe me!). For a lighter option, try it with cauliflower rice, a side of broccoli, or wholegrain brown rice. My simple version of the retro favorite is a perfect example of when less is more. With less effort, less struggle, and less time in the kitchen, you get a dinner that achieves more. More nourishing food for your body, more special time as a family around the table, and more satisfaction for YOU…because you deserve the opportunity to enjoy your food, to be proud of what you have accomplished, and to feel like a great success…even when you’ve actually done less. This healthy Salisbury Steak is lightened up with extra lean ground beef that has been seasoned with dry French Onion Soup Mix spices. The creamy Salisbury Steak gravy is made with fresh mushrooms, onions, a packet of dry au jus mix, and 98% fat free condensed cream of mushroom soup. You can grab organic, gluten-free brands of the condensed soup at many grocery stores, if that’s a concern for your family. You’ll want to brown the ground beef patties in a hot skillet or in your slow cooker (if your slow cooker has the sauté/browning function) before combining the rest of the ingredients in the Crock Pot. 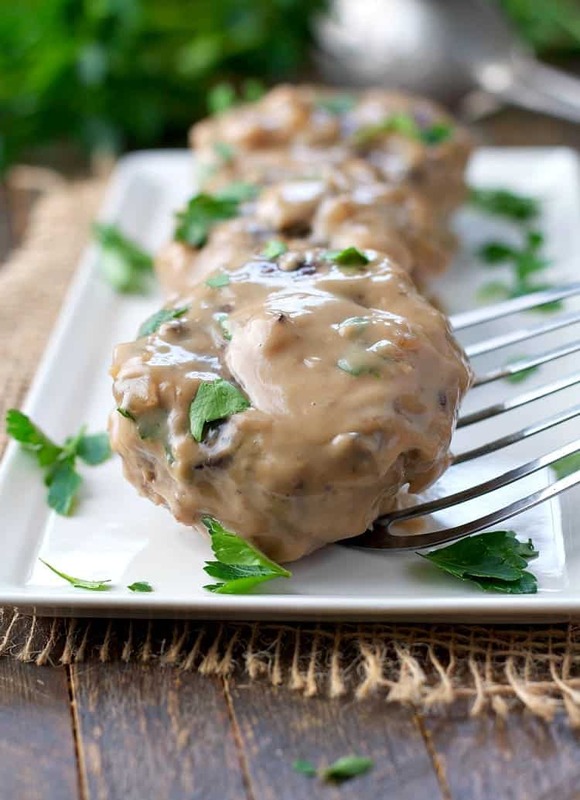 This gives the Salisbury Steak great flavor and texture! 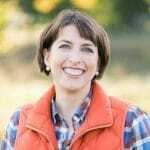 I love this slow cooker because it can perform all of the necessary functions — which means fewer dishes for me to wash at the end! Then just set it and forget it! 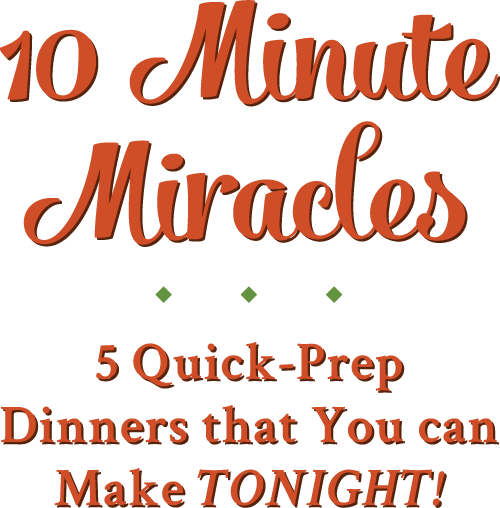 The Crock Pot does the rest of the work for you, which is why I love a slow cooker meal so much! While it won’t quite taste the same, this recipe will also work with ground chicken or ground turkey. 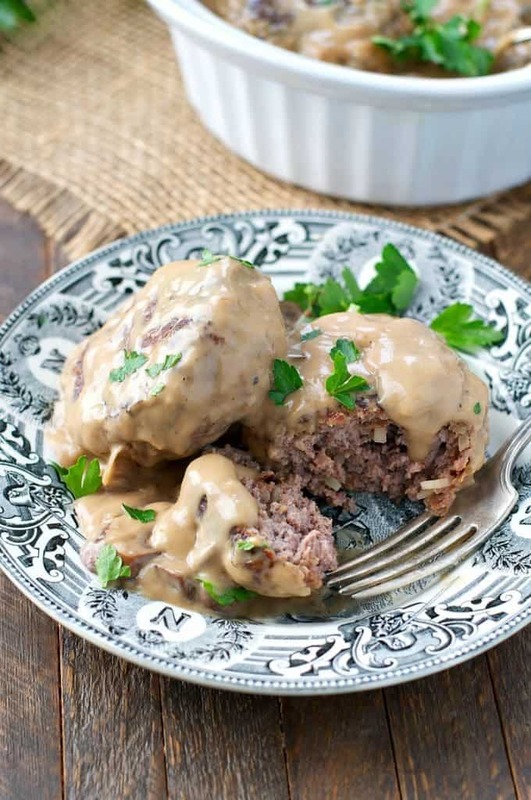 For a fun twist, try shaping the beef mixture into round balls to make Salisbury Steak meatballs! The rest of the cooking instructions remain the same. If you’re in more of a hurry and you don’t want to wait for a slow cooker supper, you can also bake the Salisbury Steak in a covered casserole dish in the oven. Those instructions are included in the recipe! For big appetites, serve this dinner with mashed potatoes, egg noodles, or 3-Ingredient Buttermilk Biscuits to soak up the extra gravy (there’s plenty, believe me!). For a lighter option, try it with cauliflower rice or wholegrain brown rice. I like to include some green veggies on the plate as well. Try this Oven-Roasted Broccoli, a tossed salad, or Perfect Oven Roasted Asparagus. In a large bowl, gently use your hands to mix together ground beef, onion soup mix, breadcrumbs, and milk. Shape meat into 4 patties. Heat about 1 tablespoon of oil in a large skillet over medium-high heat. Cook patties for about 3 minutes per side, or just until browned (but not cooked through). Place onions and mushrooms in the bottom of a large slow cooker. Place patties on top. In a medium bowl, whisk together condensed soup, dry au jus mix, and water. Pour sauce into the slow cooker. To Prepare the Salisbury Steak in the Oven: This dish can be prepared in a casserole dish in the oven, instead of in a slow cooker. 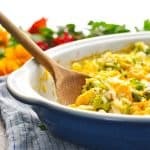 Just place the ingredients in the casserole dish, cover, and bake at 325 degrees F for about 1 hour. Cooking for Just Two? You can cut the Salisbury Steak recipe in half and prepare 2 patties with half as much gravy. Since ground beef is often sold in 1-lb. packages, freeze the remaining 1/2-lb. of meat and use it for a later meal. 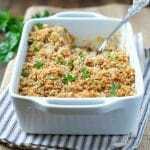 While it won't quite taste the same, this recipe will also work with ground chicken or ground turkey. For big appetites, serve this dinner with mashed potatoes, egg noodles, or 3-Ingredient Buttermilk Biscuits to soak up the extra gravy (there's plenty, believe me!). For a lighter option, try it with cauliflower rice or wholegrain brown rice. This recipe was originally published in February, 2017. It was updated in October, 2018. Yes! I’m trying to focus less on what I don’t need to, and to be more present in the moment. That can be so hard, but it’s a goal that I’m working on. 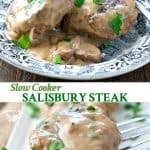 Salisbury steak is a favorite of my husband and I, so I’m loving this slow cooker version! I’ve only made it in a skillet before, so I’m excited to try this version. 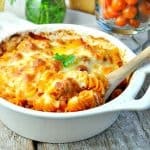 Definitely perfect comfort food! Thanks so much, Gayle! I hope that you get to try this version. It’s so darn easy! This looks yummy! Any advice for mushroom haters? Would it just be silly to try it without? I was thinking I could use additional onion and perhaps cream of chicken soup? Cream of chicken or celery works as a substitute for mushroom. I have a reaction to mushrooms and have learned to substitute instead of mushroom. If you are really brave you can try cream of asparagus. That should make an interesting substitute. I’ve never had salisbury steak before, however, it’s something Jesse talks about all the time so I think I need to try your recipe! He was actually talking about it on Tuesday because I had a meeting in “Salisbury Avenue” and he was all “I wonder if they make Salisbury Steak in Salisbury Ave” and I had NO idea what he was on about, haha! My guys love salisbury steak, but I don’t make it very often. I love using my crockpot, so this is going on my list. Also, I use flaxmeal instead of bread crumbs, to cut down on carbs. Love the idea of using flaxmeal as a breadcrumb substitute, Joanne. I’ve never tried that, but now I’m curious. Thanks for the tip! I’ve been doing well with my goal of eating more vegetables. I discovered broccoli slaw and cauliflower pearl are way better than lettuce for a salad base. I have been good at prepping the other veggies and placing them in the frig in containers. Easy to fix a big ole salad for my lunch. I add some tuna or deli meat for a protein kick and use fat free dressing. Yum. I totally agree, Suzie! I love using riced cauliflower or broccoli slaw for a more filling base than a regular salad. You’re doing AWESOME! I just wanted to stop back by and tell you I made this for dinner tonight and it was AMAZING! 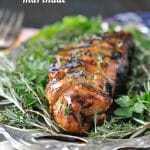 Great flavor and leftovers will make another great meal. Fabulous recipe, thank you!! Another win!! This dinner was SOOO delicious. And the gravy….swoon! Served this with mashed potatoes and peas, and both my husband and one year old daughter gobbled it up. Thanks, Blair! This time, I’m definitely NOT impressed! There’s waaay too much sodium in the ingredients. Also, what is the advantage (if any) to use a slow cooker, after already sautéing the Salisbury Steaks in a skillet? You might as well just continue on with the recipe, and finish it off in the oven. Since the cooking time in the slow cooker is only 3-4 hrs., this wouldn’t even work if you left it to cook in the slow cooker while you went to work in the morning.